Lent is a season of prayer, penance, and almsgiving. During this blessed time of the year, we are inspired and strengthened in our Lenten disciplines by the lives of the saints. It is fitting, then, that we should turn to Saint Francis of Assisi for guidance and intercession. In this story from the Little Flowers of Saint Francis (the 13th century series of legends about the Poor Man from Assisi), we read about his extraordinary Lent on a deserted island in Lake Tresimino, which is located approximately forty miles from Assisi. As a true servant of the Lord, Francis was almost like another Christ because he was given to the world for the salvation of souls. In so many ways, God willed that the saint’s actions should be conformed to the image of Christ Jesus, his Beloved Son. 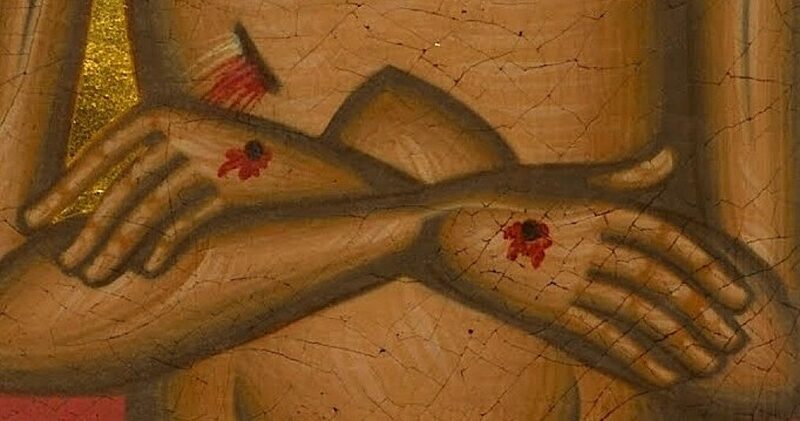 We see God’s will at work in the life of Saint Francis, and through the example of his first twelve companions, the miraculous mystery of his sacred stigmata (the five wounds of the Crucified Christ), and the story of his long Lenten fast at Lake Tresimino. It happened this way: Francis traveled to a friend’s house, which was located near the lake. At this house, God inspired him to spend the Holy Season of Lent on a isolated island in the middle of the lake. Francis prayed that his friend would take him in secrecy to the uninhabited island on Ash Wednesday. Out of great love for the saint, this friend and follower, unknown to the annals of history, carried him to the island. When they arrived, Francis begged his friend not to return until Holy Thursday and to keep his secret. So pledged, the man departed the island by boat. Francis was now alone with God. He brought only two small loaves of bread. And since there was no shelter on the island, he retreated into a deep thicket, created a little hut from branches and reeds, and devoted himself to the contemplation of heavenly things. Francis remained alone with God on the island for the forty days and forty nights of Lent. He ate and drank nothing except for one half of one of the small loaves. Upon his return to the island on Holy Thursday, the friend confirmed this truth by finding both loaves of bread: one entire loaf and one half of another loaf. Francis reluctantly admitted that he fasted out of humble reverence for the Lord Jesus Christ, who fasted for forty days and forty nights without food of any kind. However, Francis ate one half of one of the loaves to keep himself from the poison of pride which is so common among those who claim to follow the Lord. Afterwards, on this small island where Saint Francis fasted and prayed, God granted many miracles. People began to inhabit the island, to build houses, and to create a community of faith that included a house for the friars. This humble dwelling was called the House of the Island. Even now, all who live on this sacred island are strong in their faith. They have great devotion to Saint Francis and reverence for the deep thicket where he fasted and prayed as his Savior once fasted and prayed for forty days and forty nights. Amen! and to desire always what is pleasing to you. Saint Clare of Assisi, pray for us!